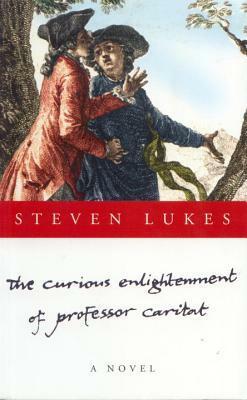 In The Curious Enlightenment of Professor Caritat Steven Lukes, as the blurb says, does for political philosophy what Sophie's World did for philosophy in general. Sort of. The novel is essentially a satire of various political ideals. The title character, Professor Nicholas Caritat, an enlightenment scholar, is forced to flee his home country of Militaria, after he is arrested and put in jail. Broken out by a resistance group called the Visible Hand he is charged with travelling around the world and finding the best possible one, that is finding the country with the best system. His code-name is Pangloss, a reference to the character from Voltaire's Candide who maintained, in the face of catastrophe after catastrophe, that they lived in the best of all possible worlds (a wry reference to Leibenz). So Caritat journeys through the world of Utilitaria, Communitaria and Libertaria, in each one finding a country dedicated to one system, and one system alone, that initially seems to work well, before the problems are exposed. It is a satirical blast at the various factions of political philosophy and Lukes is a fair satirist, in that he treats everyone with equal disdain (but for one omission, more on that in a moment). The odd one out in the group is Militaria, which seems to be based on everything Lukes dislikes (police-state, French postmodernist philosophy and Richard Rorty - a decidedly unusual mix). I suspect the actual inspiration is Hobbes' leviathan taken to an extreme conclusion. The strongest section of the book is undoubtedly Caritat journeying through Utilitaria. Lukes does a good job presenting a world that looks pretty good, everyone smiles, everyone is happy, there is strong welfare provisions for all, before slowly revealing that the world is not quite so perfect and that there is an insidious undercurrent to it all. In particular is the revelation that the farewell homes that Caritat is taken to by Gregory, the professor helping him, are not nice old people’s homes but euthanizing centres, that also take care of the unemployable and otherwise deficient. The people, as it were, smile out of fear that people might think they are not contributing to the overall happiness. This is a good and funny section as the baffled Caritat bounces around people arguing over who should be the ones to make calculations of utility (ordinary people with their pocket calculators - called the 'Actor' groups - or people with specialized knowledge who make the decisions for them, the 'Rule' group). Caritat, after being kidnapped by a terrorist Bigotarian group, is rescued by a Communitarian citizen, Goodington Thwaite and is taken to Communitaria and then, from there, he flees to Liberataria. These sections are still funny and still pointed in their satire, but not quite a successful as Utilitaria. They are shorter and there is no sense that they might be the perfect world, as was the case in the utilitarian land, before it is slowly undermined as Caritat journeys through it and understands the world. They are shown to have flaws effectively from the off. Although Communitaria has respect for different communities, they are in fact ghettoised, with each community split off from one another and not interacting. The task of showing respect to ethnic and religious groups (the two major divides, there being an Ethnic lower house parliament and a Religious upper house parliament) in practice descends to the case of not showing offense to anyone, meaning that certain words, phrases and even satire are banned. Students at the university are heavily restricted in what they can do or say and interethnic and interreligious marriages are frowned upon and can lead to excommunication. After a run-in with a female professor, who accuses him of making improper advances, Caritat flees to Libertaria. Here libertarian philosophy rules, and everything is privatized, is being privatized or has a price attached to it. Caritat, for example, has to pay for three different tickets on the train, in order to pay the train maker, the train operator and the railway line operator (as well as a charge for using the platform). A thinly-veiled caricature of Margaret Thatcher closes down a psychiatric ward, giving the patients their 'freedom', to make way for a plastic surgery ward, altogether more profitable. Although Caritat occasionally commits a crime in this world he is not punished. As one character explains, the police are privatized so for most crimes it’s not worth the bother paying the fee to call them out. Throughout all this Caritat writes letters to the Hand member who freed him, Justin, as to his thoughts on the world, discussing it as a place he would him and his children to live whilst also looking at it from the point of view of where an unborn embryo would want to be born. Here Lukes is able to outline the trouble with each world, making it clear what the problems are with the general philosophy. Caritat also has conversations with enlightenment philosophers in his head before going to sleep, though this part of it feels tacked on and sort of disappears towards the end of the story. The satire itself is very good, although it's hard to know how well it serves as an introduction. Unless someone was familiar with the philosophies I'm not sure they would know enough of what was going on, and whether there is enough of explanation of the worlds, in order for them to get the joke. As such it feels like an in-joke from one professor to another. Caritat ultimately does not find the perfect world, though he holds out hope for journeying towards it. As above I noted that one major philosophy was noted by its absence: liberalism. Socialism/communism gets an airing, in Proletaria, and appears near-perfect but it's revealed to all be a dream (the satire their being pointed and obvious). At the end of the Libertaria piece Caritat sets out on foot to find Egalitaria, a supposed mythical place where all are equal. This, presumably, is the world of liberalism. If the work of satire is pointing a way to a conclusion, what Lukes seems to be suggesting is that liberalism is the best that is achievable in reality (communism would obviously be great but it's not possible, just a dream). I think there is a problem with this though. In not satirising liberalism Lukes seems to be ducking out, as if worried that his preferred system would not be able to handle the satire. I suppose it is true that liberalism is a hodgepodge of everything else, or at least it is nowadays, so one could argue that all of it is effectively satirised (multiculturalism in Communitaria, welfare and happiness seeking and social calculation in Utilitaria, negative freedom in Liberatria etc.) but its omission is none the less notable. Caritat never gets to Egalitaria, not knowing whether it exists, but thinks he sees some lights in the distance as he sets out on his journey, and the story ends there. After conversing with the Owl of Minerva, and seeing some activists in trees protesting against the bulldozing of trees to build a parking lot, Caritat/Lukes announces his conclusion: that trying to build a perfect world on one system is always doomed to fail, as it will not encompass enough of the human experience. Rather a piecing together of different parts of it is necessary. The activists then show that one has to keep battling, striving and fighting for what one believes in and in order to make things work. The book has some ups and downs, as mentioned it’s not quite as good after Utlitaria, and some of the explanatory sections are awkwardly placed and feel forced in. Nonetheless it does what it sets out to do well. As the end of the book symbolises, the perfect system is a myth, a dream, but it’s one that we have to keep working and journeying towards, even if it can never be met. If nothing else that is a pretty good message to take away.